I ❤️ the colors and patterns in shirts. I have to say that many shirts we have in the US are fairly bland. The shirts that Aincrso are so much more than typical US shirts. I did have trouble choosing a Aincrso shirt. In the end I tried to pick a shirt that was different from anything else I've owned. I also really liked their black shirt with colorful flowers on it. A part of me wished I would have picked that one. Not because of the colors, but because of the cut. I'm not a huge fan of the line right above the stomach line. The black tunic with flowers didn't have that same line that I noticed. In all they have 15 different choices, with varying colors and patterns. I like all sleeve lengths. I do have one slight problem, I have ape arms - also known as really long arms. Long sleeves sometimes aren't long enough. Short sleeves can only be worn comfortably in the spring and summer here in Nebraska. 3/4 sleeves are ideal! They can be worn any season, and I don't have the problem of my arms being too long for the sleeves. You can get it on Amazon http://www.amazon.com/gp/product/B07BLQDQLN for $19.80 on Amazon Prime. What do you look for in a shirt? Disclaimer: I got this product for a discounted price in exchange for an honest review. I only review items I think my readers, or family can use. I'd love to be able to wear 3/4 sleeves the majority of the year. That shirt really is cute, but I can see where you would have a problem with the seam right above the stomach. I think it has such a pretty pattern and colors. I like 3/4 sleeves too, because they really are perfect for any time of the year. It's nice and long. 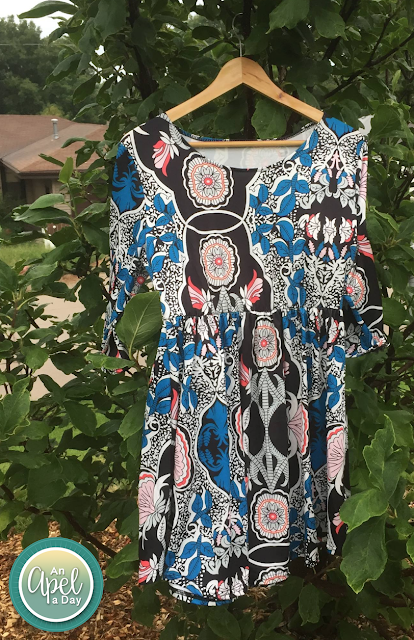 I like 3/4 length sleeves too and the print on this tunic is nice.